More Grand Assumptions: Tax Wall Street! END AIDS! Tax Wall Street! END AIDS! Speaking of the Occupy Wall St. phenomenon — allow me to draw your attention to something on the topic, something of global proportion and universal importance: the right of all individuals — of the 99%, not just the 1% — to lifesaving healthcare, especially in the case of preventable illness, including AIDS! The AIDS Crisis isn't over. Don't know what you've heard, but it's not. It isn't over — but it could be! And so — the infamous and influential AIDS activist group ACT UP has called for a massive demonstration and march on Wall Street on Thursday, April 25. It is ACT UP New York's 25th Anniversary this month, and on this anniversary they are pulling out all the stops. 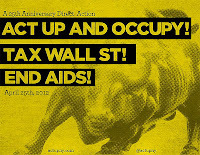 They are joining forces with OWS to form a united front in calling for universal healthcare, and the END OF AIDS! For now, to stay abreast of developments, I recommend checking actupny.com for the latest. 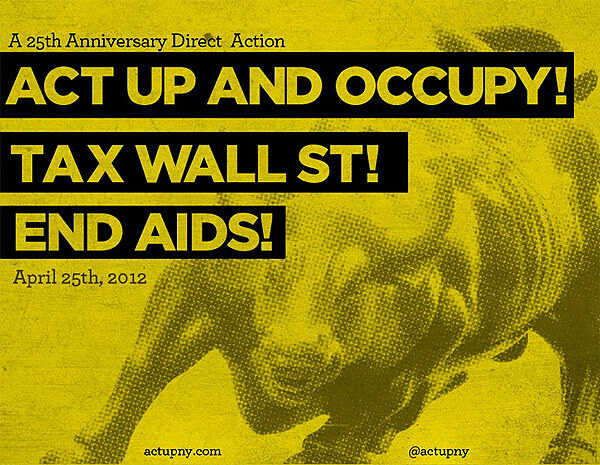 You can also follow @actupny on Twitter. And needless to say, stay tuned right here for more as well! I am committed to see this call to action ECHO across the U.S. The action will be in New York but the need is global. America needs to lead, and the time is now. AIDS is now. END AIDS NOW!